The site of several nuclear reactors, including fast breeders on the remote north coast of Scotland, Great Britain. Decades of experimenting and reckless dumping of nuclear waste in a shaft have made the place a nightmare of Britain's nuclear legacy. It is a very tall order for the company contracted the the decommissioning and the clean-up of the site, which is curreny ongoing. 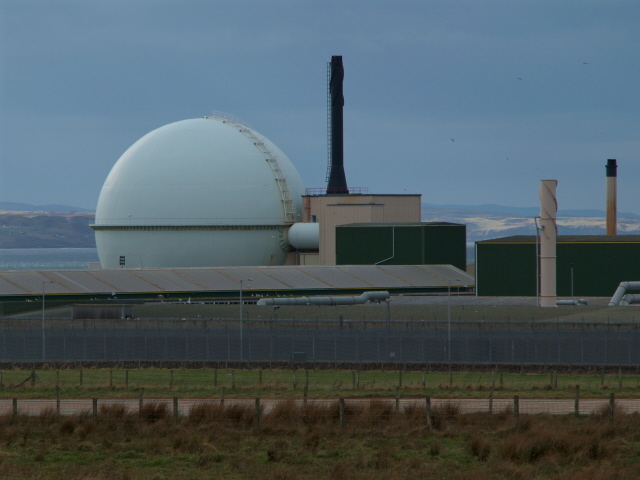 More background info: The most notable feature of Dounreay (sometimes also spelt 'Dunreay') is the large experimental Fast Breeder Reactor, whose huge golf-ball-like steel globe still dominates the skyline of the area. This experimental fast reactor dates back to the mid to late 1950s and from 1961 it became the world's first reactor of this type to supply electricity to a national grid (if only on a small scale between 14 and 60 MW – figures given vary). It closed down in 1977. It was joined by another, larger Prototype Fast Reactor (PFR) with an output of 250MW, enough to power a medium-sized town. Construction of this reactor began in 1968 and it became operational in 1974. It was closed in 1994 and decommissioning is under way. The very first reactor at Dounreay, however, was the Materials Testing Reactor, begun in 1955 as Scotland's very first reactor. Its task was mainly preparatory research in the development programme for the fast reactor concepts. This reactor closed in 1969 and has already been decommissioned. Its original control room console was donated to the the Caithness Horizons visitor centre in Thurso where it has been on display since 2015. The experimental fast breeder reactor posed the biggest challenge, given its unique coolant of liquid metal alloy of sodium and potassium. 57 tonnes of the stuff have to be disposed of. Work on this has begun but it is still a tall order. For a while it was considered whether the iconic globe of the experimental fast reactor, i.e. the spherical outer containment structure made of steel, should perhaps be preserved and maintained as a cultural/industrial heritage landmark. When I was in Dounreay and Thurso last, in late March 2016, I spoke to one of the former employees (now retired) who worked at the site and asked whether he reckoned they would keep it. He was quite dismissive of the idea, saying it would simply cost so much to decontaminate, refurbish and then maintain the “golf ball”, so he couldn't see that happening. This has meanwhile also been confirmed by the current decommissioning company. From a heritage point of view this is a shame, but it was probably inevitable. Also part of Dounreay are the Fuel Cycle Area and the Vulcan site. The former was unique in that it managed the plant's own fuel and waste, including reprocessing of old fuel rods. This is also undergoing decommissioning now. The Vulcan site is separate from all these sites but also part of the larger Dounreay complex, although it is managed independently, namely by the Royal Navy. It was here that the reactors for the British fleet of nuclear submarines were developed and tested. In fact, the test reactor for the current type of reactor powering the contemporary fleet of subs is still in operation at the Vulcan site. Its nuclear waste is sent to the neighbouring storage facilities of Dounreay. 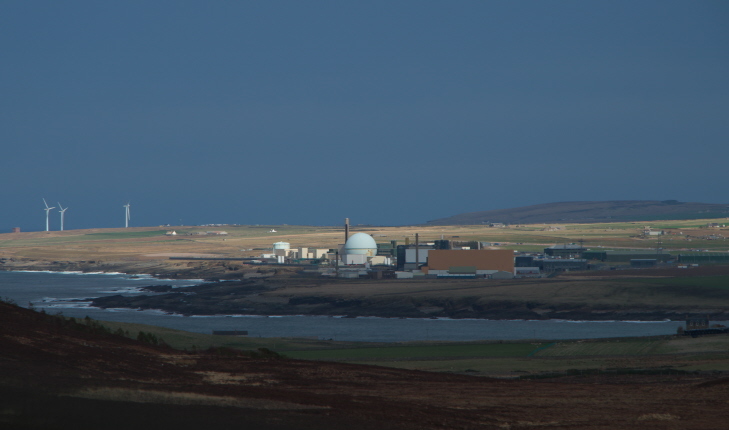 Dounreay is listed here as a site of dark-tourism interest not just because of its historical role in the development of atomic energy in Britain and because of its Cold War atomic arsenal, including its nuclear subs, but also because it is, together with Sellafield, one of the environmentally most problematic nuclear sites in Britain. It demonstrates how naivety and negligence in planning and managing such sites, especially the handling of nuclear waste, can lead to a legacy that could threaten generations to come. Probably most importantly, there is the issue of the shaft used to dump nuclear waste at Dounreay between 1959 and 1977, when an explosion occurred prompting the closure of the site. No records were kept as to what exactly was thrown in there so the chemical cocktail could be extremely dangerous. This still is a time bomb also in so far as erosion from the Atlantic Ocean will eventually expose the shaft's contents to the elements, so it has to be cleared out before it can come to that. Work on this difficult task is currently being planned, and scheduled to begin in 2024. There are also nuclear particles on the seabed outside Dounreay, some of which have been found washed up on local beaches, so monitoring and cleaning the seashores is also part of the decommissioning process. All the decommissioning and clean-up work is done by a specially set up private company (Dounreay Site Restoration Ltd) operating under contract with the Nuclear Decommissioning Authority. The cost for all this was initially estimated at something like 2 billion pounds. This quickly skyrocketed (as usual in such cases) and what the real costs ultimately will be is anybody's guess. What is clear is that Dounreay will remain in use as an intermediate waste disposal facility for some time to come. Whether it will ever be possible to genuinely clean up the site completely remains uncertain – and will be, ultimately, for the next few hundred years or so. What there is to see: The landmark globe of the Fast Breeder Reactor can be seen from miles away when driving past on the main coastal road, the A836. You get a particularly good view of the whole site (weather permitting) from the west, where the road descends a slight slope before bending north-east and passing south of the complex en route to Thurso. Today there is also a public viewing area – meaning a car park set some way away from the plant (better take a zoom lens!). In addition there are a couple of information panels providing a basic minimum of background information about the site. The approach road to the public viewing area takes you a little closer to the main sight – the “golf ball” reactor building, but you cannot park there. Nor are you allowed to wander around the place anywhere outside the public viewing space. The signs are quite clear about this – so do not try and infiltrate the site … and remember that there there are armed guards to make sure you don't. In any case, if you want to see this site better go sooner rather than later, before they start dismantling that iconic “golf-ball” sphere. There used to be a visitor centre at the site including an exhibition about the place's history, but this was closed several years ago. However, the good news is that much of the old visitor centre's contents have been moved to a new location, namely to the Caithness Horizons visitor centre in the nearby town of Thurso! So that's now the place to go to learn more about the site ... and see some pretty stunning original artefacts too! Also in Thurso is a Dounreay Information Centre run by the company undertaking the decommissioning and clean-up work. This centre is more about PR than history, but they have glossy brochures and such stuff about the place. Location: right by the main east-west road, the A836, along the north coast of Caithness, Scotland, Great Britain, just under 10 miles (15 km) west of the town of Thurso. Access and costs: remote and heavily restricted. Details: quite typically for such a sensitive nuclear installation, it's in a very remote location (for Britain), in the very farthest north of Scotland, but still relatively easily accessible by road – and there are also buses going along this road. There is no access to the site itself for the general public. However, there is now a public viewing area – it's signposted from the turn-off from the main road. Do not deviate from the prescribed route. Security is tight here. There used to be a visitor centre (with free admission) but this has gone. However, most of its contents have been moved to the Caithness Horizons visitor centre in Thurso. Time required: not long, maybe 10 minutes or so for reading the panels and generally taking a good look at the site. Getting there and away will certainly take longer. Add time to see the exhibition in Thurso though! Combinations with other dark destinations: The premier must-do combination with going to the site itself for a brief glance is seeing the exhibition at the Caithness Horizons visitor centre in Thurso, which incorporates the old exhibition of the former visitor centre at Dounreay as well as the complete control room of the decommissioned Materials Testing Reactor (see above). Really, you cannot do one without the other if you've made it all the way up to the northernmost end of mainland Britain. Otherwise there is nothing else especially dark nearby. The next closest other dark site in Scotland, and one also linked to the nuclear theme, is located down near St Andrews, some six hours' drive away: Scotland's Secret Nuclear Bunker. Combinations with non-dark destinations: plenty – the far north of Scotland is well worth a comprehensive holiday in its own right. To the east, there's the "other Land's End" at John o'Groats – it's not much to look at, but a popular destination for its end-of-the-road aura. From here to Land's End is the longest distance there is across Britain. More scenically appealing is Dunnet Head, which is actually the northernmost bit of land in Britain. And there is a picturesque lighthouse there too. It's roughly halfway between John o'Groats and Thurso. The town of Thurso itself is a provincial little place with some appeal, but also with a distinct outpost feel. However, the ferry port of Scrabster just north of the town, provides access to the spectacular Orkney Islands that you can see from the mainland (and esp. Dunnet Head) on a clear day. The cliffs and sea stacks just opposite on the island of Hoy are amongst the tallest in the British Isles. Especially dramatic sea stacks can also be found just south of Duncansby Head east of John o'Groats. This is a hike, though. At the other, western end of the coastline of northern Scotland there's Cape Wrath which also boasts some of Britain's highest cliffs. The Cape is only accessible by first a short boat ride and then a 45-minute tour by minibus. But the tours can only run when the MoD firing range that has to be crossed to get to the Cape is not being used. Nearby is the pretty town of Durness, with some fine sand dunes and beaches, and Smoo Cave, which you can simply walk into (inside there's a waterfall that you can see if you're prepared to get very wet …). Further afield are all the attractions of Scotland at large, scenery, castles, whisky distilleries – the lot.